Join Us!!! We are looking for someone to help us cover Japanese basketball. Please send us an e-mail. American Power forward Allen Durham (198-F/C-88) had an amazing evening in the last round for Shiga L-Stars, receiving a Interperformances Player of the Week award for round 56. The 30-year old player had a double-double of 34 points and 14 rebounds, while his team edged out Kyoto Hannar. (#3, 29-27) 90-88. Shiga L-Stars maintains the 5th position in their group in Japanese B League. Shiga L-Stars is rather a weak team placed in lower part in the standings. They need more victories to improve their 17-39 record. Durham just recently signed at Shiga L-Stars, being already a very valuable addition to the team. Former Grace Bible College star has very solid stats this year. Durham leads league in rebounds with 13.6rpg. Durham is in league's top in and averages impressive 53.7% FGP. Worth to mention Durham played also at Eurobasket Summer League, which helped him get the job in pro basketball. The second best player in last round's games was 28-year old Zimbabwean Julian Mavunga (203-PF-90, agency: Pensack Sports) of Kyoto Hannar.. Mavunga had a very good evening with a double-double of 30 points and 13 assists. Bad luck as Kyoto Hannar. was edged by slightly lower-ranked Shiga L-Stars (#5, 17-39) 90-88. Kyoto Hannar. managed to keep the same 3rd spot in West. His team's 29-27 record is not bad at all. Mavunga is a newcomer at Kyoto Hannar., but is already one of team's top players. He belongs to the best scorers in the league with 22.1ppg (#5). His other stats are also decent: 8.6rpg and 8.7apg. Third on the list of top players last round was Canadian center Robert Sacre (213-C-89) of Hitachi SR (#4). Sacre got into 30-points club by scoring 31 points in the last round. He went also for ten rebounds . Despite Sacre's great performance Hitachi SR lost 73-81 to #3 ranked Toyota Alvark. But his team cannot count on just a single shooter as he also needs help of the other teammates especially in such crucial game. The chances of Hitachi SR ranking at the top of East, however are very questionable as they have already lost 29 games, recording just twenty seven victories. With bigger assistance of his teammates, Sacre could help Hitachi SR to bring them higher in the standings. Sacre has a very solid season. In 56 games in Japan he scored 19.5ppg. He also has 9.1rpg and FGP: 52.6%. The Player of the week is selected based on efficiency calculation, but also including game result, importance of the game, if played recorded double-double/triple-double, etc. The efficiency formula is a combination of various formulas used by different basketball organizations/leagues. We got involved many basketball scouts and journalists to assure it's accuracy. 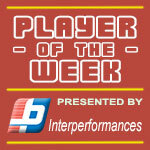 The Player of the Week awards are presented by Interperformances. Interperformances is a full-service agency specializing in the representation of professional athletes the world-over. With more than forty-eight years of experience, INTERPERFORMANCES is well known to all professional teams and clubs. General Managers trust and rely on our opinions and recommendations. Experienced American Hilton Armstrong (210-C-84) had a very impressive game in the last round for league's second-best Nagoya DD and that's him to receive a Interperformances Player of the Week award for round 60. The 34-year old center had a double-double of 22 points and fifteen rebounds, while his team edged out Fukuoka Rizing (#6, 12-48) 84-83. Nagoya DD maintains the 2nd position in their group in Japanese B League. Nagoya DD is a typical solid league team placed somewhere in the middle or a little bit lower in the standings. They need more victories to improve their 33-27 record. Armstrong just recently signed at Nagoya DD, being already a very valuable addition to the team. University of Connecticut graduate has very impressive stats this year. Armstrong is in league's top in rebounds (6th best: 11.8rpg) and averages solid 2.0bpg and 63.1% FGP. The second most remarkable performance in last round's games was 31-year old point guard Shinnosuke Ohishi (174-PG-87) of San-en. Ohishi impressed basketball fans with a double-double of 35 points and 10 rebounds. Bad luck as San-en lost that game 79-91 to slightly higher-ranked Toyama Grouses (#3, 33-28). San-en managed to keep the same 5th spot in Central. His team is not often considered as one of the league's best with a mere 22-38 record. Ohishi is one of the most experienced players at San-en and has a reputation of one of team's most reliable players. The third best performed player last round was American Eric Jacobsen (208-PF-94) of Fukuoka Rizing (#6). Jacobsen showcased his all-around game by recording 20 points, fourteen rebounds (!!!) and six assists in the last round. Despite Jacobsen's great performance Fukuoka Rizing lost 83-84 to the higher-ranked Nagoya DD (#2, 33-27). But his team cannot count on just a single player as he also needs help of the other teammates. Fukuoka Rizing can only dream about fighting for top spots in West. They have rather bad season and 12-48 record places them close to the bottom of the standings. Too bad for Jacobsen he does not play for a better team. But maybe if he did, his season stats would not be that high. Jacobsen has a very solid season. In 36 games in Japan he scored 16.0ppg. He also has 8.6rpg and FGP: 51.4%. American Evan Ravenel (204-C/F-89) had a very impressive game in the last round for Fukushima and that's him to receive a Interperformances B2 League Player of the Week award for round 60. The 29-year old had the game-high 35 points adding eight rebounds and three assists for Fukushima in his team's victory, helping them to edge out Cyberdyne IR (#3, 35-25) 90-88. Fukushima maintains the 4th position in their group in Japanese B2 League. Fukushima is a typical solid league team placed somewhere in the middle or a little bit lower in the standings. They need more victories to improve their 27-33 record. In the team's last game Ravenel had a remarkable 71.4% from 2-point range. He turned to be Fukushima's top player in his first season with the team. Evan Ravenel averages this season 21.9ppg and 9.0rpg. The second most remarkable performance in last round's games was 37-year old American forward Reginald Warren (204-F-81, agency: Inception Sports) of Kagawa FA. Warren impressed basketball fans with a double-double of 29 points and 15 rebounds. Of course he led Kagawa FA to another comfortable win 90-77 over the higher-ranked Shimane SM (#2, 43-17) being unquestionably team leader. Kagawa FA's 6th position in West has not changed. His team is not often considered as one of the league's best with a mere 19-41 record. Warren is well-known by Kagawa FA fans and he already established his position as one of team's most reliable players. The third best performed player last round was American Will Creekmore (205-C-89) of Yamagata (#5). Creekmore showcased his all-around game by recording 23 points, seventeen rebounds (!!!) and seven assists in the last round. He was a key player of Yamagata, leading his team to a 84-78 win against the higher-ranked Gunma (#1, 43-17). The chances of Yamagata not to end season at such low position in East, however are less than slim as they have already lost 38 games, recording just twenty two victories. With bigger assistance of his teammates, Creekmore could try to bring Yamagata's a little bit higher in the standings. Creekmore has individually a great season in Japan. After 18 games, he made it on the list of the league's leaders in rebounds with 12.9rpg (7th best). The Regular Season in B League just ended. Here is the last round review presented by ESL. Sixth-ranked Fukuoka Rizing (12-48) made lots of trouble for second ranked Diamond Dolphins (33-27) on Sunday. The visitors from Nagoya managed to secure only one-point victory 84-83. However their fans expected much easier game. Diamond Dolphins looked well-organized offensively handing out 24 assists. The best player for the winners was American center Hilton Armstrong (210-84, college: Connecticut) who had a double-double by scoring 22 points and 15 rebounds. The other American import Craig Brackins (208-87, college: Iowa St.) chipped in 21 points, 9 rebounds and 5 assists. At the other side the best for losing team was American Eric Jacobsen (208-94, college: ASU) who recorded a double-double by scoring 20 points, 14 rebounds, 6 assists and 4 steals. Diamond Dolphins have a solid three-game winning streak. They maintain second position with 33-27 record having nineteen points less than leader Ryukyu GK. Fukuoka Rizing lost third consecutive game. Newly promoted team keeps the sixth place with 48 games lost. Important game to mention about took place in Osaka. Fourth ranked Osaka Evessa (23-37) saved a 1-point victory at home edging one of their biggest challengers Kyoto Hannar. (31-29) 52-51 on Sunday evening. It ended at the same time the two-game winning streak of Kyoto Hannar.. It was a good game for American power forward Xavier Gibson (210-88, college: FSU) who saved his team from a defeat with 17 points and 5 rebounds. Josh Harrellson contributed with 6 points and 17 rebounds for the winners. American center David Simon (208-82, college: PFW) replied with a double-double by scoring 32 points and 13 rebounds for Kyoto Hannar.Osaka Evessa maintains fourth position with 23-37 record. Kyoto Hannar. at the other side keeps the third place with 29 games lost. They share the position with SeaHorses. An exciting game between Top Four teams was played in Tokyo. First ranked Chiba Jets faced 4th ranked Hitachi Sunrockers. Guests from Chiba (52-8) smashed host Hitachi Sunrockers (27-33) 95-74. Worth to mention a great performance of Gavin Edwards who helped to win the game recording a double-double by scoring 21 points, 11 rebounds and 4 assists. Chiba Jets' coach Atsushi Ono felt very confident that he used 11 players which allowed the starters a little rest for the next games. The best for the losing side was Ryan Kelly with a double-double by scoring 20 points, 14 rebounds and 7 assists. Chiba Jets have an impressive eight-game winning streak. They maintain first position with 52-8 record. Hitachi Sunrockers lost fifth consecutive game. They keep the fourth place with 33 games lost. Leader Ryukyu GK delivered the 40th victory. This time they beat 5th ranked Shiga L-Stars (18-42) 85-79 in Okinawa. The winners were led by Jeff Ayres who had that evening a double-double by scoring 19 points and 10 rebounds. Shiga L-Stars' coach Shawn Dennis rotated ten players in this game, but that didn't help. Ryukyu GK have a solid three-game winning streak. They maintain first position with 40-20 record. Shiga L-Stars lost third consecutive game. They keep the fifth place with 42 games lost. Leader Niigata Albirex recorded the 45th victory on Sunday night. This time they beat 6th ranked Yokohama BC (14-46) 89-73. 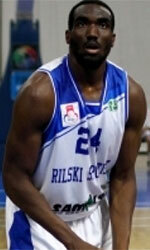 The best player for the winners was Amanze Egekeze who had a double-double by scoring 17 points and 10 rebounds. Niigata Albirex's coach Kazuhiro Shoji used entire bench and allowed the starting five to rest. Niigata Albirex (45-15) have an impressive ten-game winning streak. They maintain first position. Yokohama BC lost thirteenth consecutive game. They keep the sixth place with 46 games lost. In the last two games of round 60 Hokkaido L. was defeated by Toyota Alvark in Tokyo 81-74. Toyama Grouses beat San-en at home 91-79. The best stats of 60th round was 35 points (!!! ), 10 rebounds and 5 assists by Shinnosuke Ohishi of San-en. Important game to mention about took place in Osaka. Fourth ranked Osaka Evessa (23-37) saved a 1-point victory at home edging one of their biggest challengers Kyoto Hannar. (31-29) 52-51 on Sunday evening. It ended at the same time the two-game winning streak of Kyoto Hannar.. It was a good game for American power forward Xavier Gibson (210-88, college: FSU) who saved his team from a defeat with 17 points and 5 rebounds. The other American import forward Josh Harrellson (208-89, college: Kentucky) contributed with 6 points and 17 rebounds for the winners. American center David Simon (208-82, college: PFW) replied with a double-double by scoring 32 points and 13 rebounds and Zimbabwean-American Julian Mavunga (203-90, college: Miami, OH, agency: Pensack Sports) added 5 points, 11 rebounds and 6 assists in the effort for Kyoto Hannar.Osaka Evessa maintains fourth position with 23-37 record. Kyoto Hannar. at the other side keeps the third place with 29 games lost. They share the position with SeaHorses. An exciting game between Top Four teams was played in Tokyo. First ranked Chiba Jets faced 4th ranked Hitachi Sunrockers. Guests from Chiba (52-8) smashed host Hitachi Sunrockers (27-33) 95-74. Chiba Jets dominated down low during the game scoring 64 of its points in the paint compared to Hitachi Sunrockers' 34. They looked well-organized offensively handing out 25 assists. Worth to mention a great performance of American power forward Gavin Edwards (206-88, college: Connecticut) who helped to win the game recording a double-double by scoring 21 points, 11 rebounds and 4 assists and naturalized American forward Michael Parker (202-81, college: Evergreen St.) who added 19 points and 9 rebounds during the contest. Four Chiba Jets players scored in double figures. Chiba Jets' coach Atsushi Ono felt very confident that he used 11 players which allowed the starters a little rest for the next games. The best for the losing side was American Ryan Kelly (211-91, college: Duke) with a double-double by scoring 20 points, 14 rebounds and 7 assists and Canadian center Robert Sacre (213-89, college: Gonzaga) scored 18 points and 8 rebounds. Chiba Jets have an impressive eight-game winning streak. They maintain first position with 52-8 record. Hitachi Sunrockers lost fifth consecutive game. They keep the fourth place with 33 games lost. There was no surprise in Tokyo where 6th ranked Hokkaido L. (10-50) was defeated by third ranked Toyota Alvark (43-16) 81-74 on Sunday. Toyota Alvark forced 22 Hokkaido L. turnovers. Strangely Hokkaido L. outrebounded Toyota Alvark 36-19 including a 27-14 advantage in defensive rebounds. The best player for the winners was international Yudai Baba (193-95) who scored 12 points, 5 rebounds, 8 assists and 5 steals. Montenegrin-Serbian power forward Milko Bjelica (207-84, agency: BeoBasket) chipped in 18 points. Toyota Alvark's coach Luka Pavicevic used a ten-player rotation and allowed the starting five to rest. At the other side the best for losing team was Spanish center David Doblas (206-81) who recorded a double-double by scoring 16 points, 14 rebounds and 5 assists and British-American center Byron Mullens (213-89, college: Ohio St.) added 18 points, 10 rebounds and 4 assists respectively. Five Toyota Alvark and four Hokkaido L. players scored in double figures. Defending champion maintains third position with 43-16 record having ten points less than leader Ryukyu GK. Hokkaido L. lost twenty second consecutive game. They keep the sixth place with 50 games lost. Sixth-ranked Fukuoka Rizing (12-48) made lots of trouble for second ranked Diamond Dolphins (33-27) on Sunday. The visitors from Nagoya managed to secure only one-point victory 84-83. However their fans expected much easier game. Diamond Dolphins looked well-organized offensively handing out 24 assists. The best player for the winners was American center Hilton Armstrong (210-84, college: Connecticut) who had a double-double by scoring 22 points and 15 rebounds. The other American import Craig Brackins (208-87, college: Iowa St.) chipped in 21 points, 9 rebounds and 5 assists. At the other side the best for losing team was American Eric Jacobsen (208-94, college: ASU) who recorded a double-double by scoring 20 points, 14 rebounds, 6 assists and 4 steals and British forward Benjamin Lawson (216-95, college: WKU) added 24 points, 9 rebounds and 5 blocks respectively. Four Fukuoka Rizing players scored in double figures. Diamond Dolphins have a solid three-game winning streak. They maintain second position with 33-27 record having nineteen points less than leader Ryukyu GK. Fukuoka Rizing lost third consecutive game. Newly promoted team keeps the sixth place with 48 games lost. Leader Ryukyu GK delivered the 40th victory. This time they beat 5th ranked Shiga L-Stars (18-42) 85-79 in Okinawa. Ryukyu GK shot the lights out from three nailing 13 long-distance shots on high 52.0 percentage. The winners were led by American forward Jeff Ayres (206-87, college: ASU) who had that evening a double-double by scoring 19 points and 10 rebounds and international forward Ira Brown (193-82, college: Gonzaga) supported him with 14 points, 7 rebounds and 4 assists. Even a double-double of 30 points and 10 rebounds by American power forward Allen Durham (198-88, college: Grace Bible) did not help to save the game for Shiga L-Stars. His fellow American import swingman Henry Walker (198-87, college: Kansas St.) added 16 points and 7 assists. Shiga L-Stars' coach Shawn Dennis rotated ten players in this game, but that didn't help. Ryukyu GK have a solid three-game winning streak. They maintain first position with 40-20 record. Shiga L-Stars lost third consecutive game. They keep the fifth place with 42 games lost. Leader Niigata Albirex recorded the 45th victory on Sunday night. This time they beat 6th ranked Yokohama BC (14-46) 89-73. They outrebounded Yokohama BC 45-33 including 31 on the defensive glass. The best player for the winners was American forward Amanze Egekeze (203-95, college: Belmont) who had a double-double by scoring 17 points and 10 rebounds. The former international guard Kei Igarashi (180-80) chipped in 17 points and 4 assists. Niigata Albirex's coach Kazuhiro Shoji used entire bench and allowed the starting five to rest. At the other side the best for losing team was American forward Brandon Costner (206-87, college: NC State) who recorded a double-double by scoring 25 points, 11 rebounds and 4 assists (went 7 for 7 at the free throw line) and the former international point guard Ryo Tawatari (180-93, college: Dominican, CA) added 17 points and 5 assists respectively. Niigata Albirex (45-15) have an impressive ten-game winning streak. They maintain first position. Yokohama BC lost thirteenth consecutive game. They keep the sixth place with 46 games lost. No shocking result in a game when third ranked Toyama Grouses (33-28) defeated at home 5th ranked San-en NeoPhoenix (22-38) 91-79 on Sunday. The best player for the winners was American forward Leo Lyons (206-87, college: Missouri) who scored 26 points, 7 rebounds and 6 assists. The other American import center Joshua Smith (208-92, college: Georgetown) chipped in a double-double by scoring 23 points and 11 rebounds (went 7 for 7 at the free throw line). Toyama Grouses' coach Don Beck used a ten-player rotation saving starting five for next games. At the other side the best for losing team was point guard Shinnosuke Ohishi (174-87) who recorded a double-double by scoring 35 points (!!! ), 10 rebounds and 5 assists (went 8 for 8 at the free throw line) and American center William McDonald (211-79, college: S.Florida) added 8 points and 8 rebounds respectively. Toyama Grouses have a solid three-game winning streak. They maintain third position with 33-28 record having eighteen points less than leader Ryukyu GK. San-en NeoPhoenix lost fifth consecutive game. They keep the fifth place with 38 games lost.